What keeps us coming back is, of course, supreme lyricism. Gab rhymes multiple syllables in rapid succession (“NLP,” “Protocol”), weaves sentences full of words with common vowel sounds (“Everything is Fine”), and much more without ever projecting a need to come up for air. But there tends to be more passion and cleverness behind the bragging than the storytelling. “Wack But Good People” is an amusing two-person conversation that relies heavily on vocal manipulation techniques 2Pac ran into the ground in 1993. Gab’s delivery on “Market & 8th” comes across as if he’s narrating modern day decay from the point of view of a nose-in-the-air passerby. 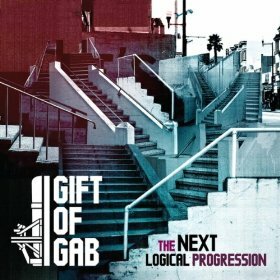 Only on an ode to exhaustingly awful relationships (“Toxic”) does Gift of Gab effectively fuse skill, insight, and expressiveness. G Koop creates an organic, good-natured atmosphere with his production, reportedly based on none other than tunes rattling around in Gab’s head. Explosive percussion and striking melodies abound, never straying too far from earthy funk templates. However, there isn’t a single beat on here as hot as “Diet Mountain Dew.” Next Logical Progression is admirable for embracing reason and maturity in hip-hop, yet does little to advance the art form.